I’m waiting for it. Waiting for lists of earnest resolutions from my fellow Genea-Bloggers. Like the New Year follows Santa, resolutions follow wish lists ... the wish lists for obscure and frustrating ancestors to pop fully formed out of the blue. Resolutions then deal with the reality of finding them ourselves. Most of said prolific fellows will undoubtedly accomplish most of their projected enterprises, and blog about it to boot. I’m going to take a pass on resolutions since I seem to recycle the same list of projects. See, I’m not in denial. Come to think of it, I didn’t blog as frequently as most genealogists. What on earth was I doing all year? Some kind of personal 2009 Top Ten list might be more fitting ... Memorable Moments, Genealogical or Otherwise? ■ New correspondents were extremely valuable for me this year. A highly regarded historian in Scotland seriously addressed one of my McFadyen questions. Turns out she’s Canadian and we enjoyed a moment sharing memories of eccentric mutual acquaintances. Other interesting and gratifying Scottish contacts were made. Equally exciting was contact with a truly committed genealogist of Latvian descent who has the multiple language skills I envy. ■ My technical skills improved slightly beyond kindergarten. A major advance was learning to talk tough, without crying, to the ISP techies who messed up my whole system. After numerous expensive surprises, I drew the line at a new keyboard. A local Asian emporium provided me with cunning stick-on letters to cover the worn-off letters (was it the cheese and pickle sandwiches?). I am hot pink. ■ Quebec land records, even at second-hand distance, can be exciting “new” resources (blogged about under Fraser and Dougall). ■ My new publisher, Dundurn Press, kindly invited me to their Christmas open house and I believe it when they say they are Canada’s largest publishing house. Hundreds of authors turned out to drink and chew, each bearing a name badge with their latest book title. The throng was so crushing, who could read them (giving new meaning to in your face). Upon leaving, I was amused to see my latest book is called Details From a Larger Canvas. 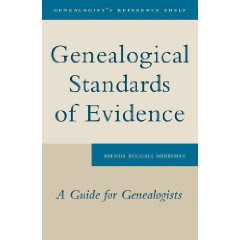 I wonder who the author of Genealogical Standards of Evidence is. February 2010 will tell. And the sub-title is changed to A Guide for Family Historians. ■ My game cousin-editor is reviewing the last McFadyen Family History draft. Her skills in the literary department are professional and I’m trying not to abuse her but she volunteered without prompting to go to the library to look at Evidence Explained. She might have passed out when the librarian staggered over with the 800-page bible. OK, it’s not a real moment, just my fantasy. ■ The OGS Conference is always an annual highlight and proved that our Ontario Chapter APG comes to the fore when events require (besides contributing a large component to the speakers’ roster). We ran our free consultations at “Ask A Professional” and even squeezed in a meeting. Genea-Blogger Steve Danko from California received his PLCGS from the National Institute; see Steve’s big grin. ■ Receiving the NGS Award for Excellence: Genealogical Methods and Sources was a unique thrill for me, a pinnacle in my mind. On the other hand, the news bypassed some of my professional organizations. Reality check: stay humble. Being nominated for Family Tree Magazine’s 40 Best Genealogy Blogs was also a pleasant surprise; results to come in their May issue. My breath is not on hold. “Vote early and vote often” takes the edge off. ■ The country’s greatest grand-daughter and future prime minister turned eleven this month. No camels in Vancouver, but I visited regardless. She’s more mature than some alleged adults I know. Since she already appreciates mystery fiction, how far can it be to real-life family history? :-) Granny treads lightly. ■ Adventure-trekker Bruce Kirkby wrote Sand Dance: By Camel Across Arabia’s Southern Desert (McClelland & Stewart, 2000), possibly the most beautiful book I’ve ever seen. He and some companions crossed the long Empty Quarter from Oman through Saudi Arabia to Abu Dhabi. FABulous photographs. He thanked me for my email thanking him. I’m in love again. ■ Some of the year was consumed with a significant family shift, viz., C3's departure for, and residency in the Netherlands. Mamma Mia has inspected the premises and declares approval of the situation. As does Wimpey, the international cat. Little of my travel adventures in the above. Oh well, there’s always that New Year beginning soon. I hear Australia is having a problem with wild camels. Page from seigneurial records of Argenteuil, St. Andrews: citation pending. 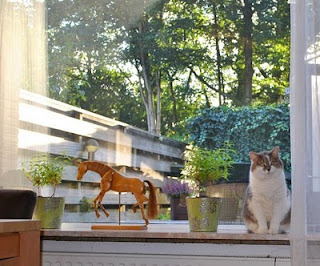 Photograph, “Wimpey at Home,” by CDM, 2009. All other photos by BDM, 2009. The Genea-Bloggers’ Advent Calendar of Christmas Music asks: What songs did your family listen to during Christmas? Did you ever go caroling? Did you have a favorite song? For me, the first and last questions centred for many years on a Christmas album published by The Kingston Trio back in the 1970s(?). The Trio found a wonderful collection of little-known and little-heard carols of both merry and poignant variety. Surely my children grew up listening to (and memorizing) those songs I played endlessly during the season. My old LP disappeared as music technology formats changed. Unfortunately I can’t find many of those songs on YouTube, especially by the old K3, but here is one by Harry Belafonte from a Muppets Family Christmas. OK, I hope I got that URL right. I’m sure I don’t remember all the titles. Question no. 2: Our first Christmas in rural farm living was a revelation in many ways. We were startled on Christmas Eve preparations—when we still had a marginal Santa youngster—by a ruckus in the front yard. What should appear, not eight tiny reindeer, but a sleighful of rosy neighbours bellowing Christmas carols. It was a sleigh because we had snow, lots of it. Pulled by a tractor, but nonetheless. We ex-urban people dithered over how quickly (unexpectedly) we could offer hot chocolate or appropriate toddies (knowing them better .. later .. they would have had their own reinforcements.) No thank you, they said, come join us, we have more concession roads still to visit. "Bless all in this house till we come again!" I’ve always collected postcards. Their professional photography plays a large part to fill in my own amateur camera attempts, and trigger my memories of places I’ve been. They also represent faraway or intriguing places my friends have visited. This is my first time “playing” in this Festival and I found one of my favourites. It’s black and white, so it fits the criteria. The postcard was mailed from Rocky Harbour NL on 7 August 2007 by my travelling daughter. A magnificent photograph that speaks to isolated communities and family salvage. Remember the Quebec Family History Society (QFHS) duo who wished to use my guinea pigs to familiarize themselves with Quebec land records? My previous posts about them are Frasers Part 8 and Frasers Part 9. Thanks to Gary and Sharon (again), their efforts have led to more information about the DOUGALL family’s early days in the St. Andrews area ... information I could not have picked up by any other means. The family patriarch John Dougall was said to have arrived in Quebec in 1834 (family outline here). I knew his farm was at a place called Beech Ridge, and this map shows the proximity of the 90-acre property to St. Andrews. John Dougall’s name does not appear in the land records. Instead, his son George was the tenant of record in seigneurial books. In the 1842 census, John was in the Argenteuil seigniory and George was recorded nearby. (1) The first Dougall appearance in the seigniorial books was 11 November 1852 on what was then known as lot 20 south side Beech Ridge. But George Dougall of Montreal was paying the requisite rent from then until the last entry I see in 1873. His first payment was apparently to catch up with 1851 arrears as well as 1852. The annual payments began at about £1.7s. and increased only a fraction over the twenty years, although sometimes interest was added for late payments. You can see the questions that arise. Why did son George assume the rent payments for the farm fifteen years before his father died? If John was still a farmer in 1861, who was working the land for him? He has no “ag labs” living with him. The absence of the agricultural schedule is a real loss. There is a gap from George’s last entry in the seigneurial records (1873) until the first entry in the Index aux immeubles for the cadastral system (1884) when the property was now designated lot 713, Saint Andrews, Argenteuil District. That first entry was notarial instrument no. 9148 dated 18 December 1884, and the primary party was Robert McBride Dougall, a carpenter and joiner in Montreal. Who? I had to scramble into my totally messy old files. This was a son of George Dougall the tailor—I did have some bare information about this family. That document occupied four full pages ... Robert “herein acting as well as for himself & in his own individual behalf, as being vested with the rights of his brother the late John Dougall, in the estate and succession of his deceased mother the late Agnes Moffat in her lifetime wife of George Dougall of Montreal tailor ...”. In short, the heirs of Agnes (Moffat) Dougall were selling their interest in the farm to their father George Dougall. At first it appeared that George Dougall Sr. had predeceased his wife Agnes Moffat but this was not the case. To make things a tad confusing, George Jr. had also married an Agnes, daughter of Robert Kirkby and Ann Harrison(4), and George Jr. had recently died. None of the dates of death are recorded. ● the sale price was $3,106.74. ● deed no. 1493 was registered in the County of Deux Montagnes registry office by notary M.G.T. Deluren [tight binding, difficult to read]. At last I have some documentation to show that the Dougalls were at Beech Ridge before the 1842 census. As yet I do not have the entire details of accessing and properly citing these land records. Gary and Sharon are pleased to add these resources to their own educational lectures and writing. Win-win. (1) 1842 Census Quebec, Deux Montagnes County, Argenteuil Seigniory; LAC microfilm C-728. (2) Dougall-Moffat marriage, Registers of St. Gabriel Street Presbyterian Church, Montreal; Archives of Ontario microfilm MS 351 reel 2. (3) John Dougall household, 1861 Census Quebec, County Argenteuil, Saint Andrews, p. 243; LAC microfilm C-1261. (4) “Quebec Vital and Church Records (Drouin Collection), 1621-1967,” digital image, Ancestry.ca (http://www.ancestry.ca : accessed 2 July 2009), Dougall-Kirkby marriage, 5 April 1875; citing St Jean Presbyterian Church, Montreal.